My son has taught me life-changing lessons. Lessons that have made me a better person since becoming a mom. For starters, he’s showed me how to embrace the simple things in life. Before I was a mom I was all over the place. I was very ambitious and I had all these goals—and now I can be ambitious while at the same time stopping to smell the roses. The first time I learned this lesson was when my son discovered water. We were in the tub and I was giving him a bath and he put his hand under the faucet and his face lit up. It was beautiful. He was appreciating the water’s beauty and how it felt on his hand. Watching that beautiful moment made me stop and realize how grateful I am to have water. We’re able to have water and take this bath which is amazing and beautiful. People who live in other countries don’t even have that luxury. Another time we were at the beach he recognized the sound of the crashing of the waves for the first time. I had gotten so used to that sound that I didn’t even stop and listen to how beautiful and how calming and just wonderful the sound of waves crashing on the beach is. Now, I appreciate it. I’ve also learned to embrace certain challenges that come my way, because there are a lot of challenges that moms face. When my son was a newborn, for example, I was constantly tired. But I learned to trust myself and say, “You know what, Tia? This too shall pass. You are a lioness. You are a warrior. You will get through this.” I’ve learned how to function being extremely tried. Another time, I was completely embarrassed when my son was 2-years-old and he had a tantrum at the farmer’s market. There were paparazzi there and I went home and cried because I felt like such a terrible mom. I was like, “Oh my gosh, people are going to judge me! They’ll say that I can’t take care of my kid out in public.” But I got over that moment. I started to confide in my other friends who are moms and they were like, “Girl, I go through the same thing.” I have patience with my challenges, too. Some of them may not be solved overnight. At the end of the day there are millions and millions of moms who are going through the same thing I am and I know I will be okay. Tia Mowry is Momtastic's July 2016 guest editor. 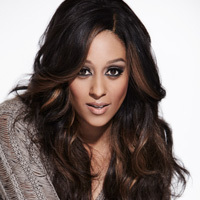 The actress, who became a pop culture icon in the ‘90s when she starred opposite her twin sister Tamera in the comedy “Sister Sister,” recently wrapped the second season of her Cooking Channel series, “Tia Mowry at Home.” She also recently launched a popular podcast “Mostly Mom,” as well as sold an untitled comedy project to Nickelodeon. Off-camera, Tia spends time working with several charities, including the Make A Wish Foundation and the Elizabeth Glazer Pediatric AIDS Foundation. Additionally, she is the author of Oh Baby! : Pregnancy Tales and Advice from One Hot Mama to Another and Twintuition, and the creator of two yoga DVDs. Born in Germany, Tia now lives in Los Angeles with her husband, actor Cory Hardrict, and their son Cree Taylor.